Today I launch the book through a small gathering in the fabulous Cardiff Bay! It’s more of a celebration than a launch as it’s taken since October 2011 to get this baby finished and available on amazon. Interesting that it’s taken so long and yet it’s not even 100 pages. But you know what Anita Roddick said “If you think you’re too small to have an impact, try going to bed with a mosquito in the room.” So I’m hoping my book, although small, has a big impact on people individually. I am also mindful that now the book is out I have no control of how people may respond or how they may interpret what I’ve written. My work is done I have to let go and not be attached to what people may think or how they judge it. Part of me did it for a personal challenge- What did I think on the subject of creativity? Part of me also did it so that people got to know about all the ‘best bits’ from the various more serious text books I’ve read on the subject- without having to go through all that reading! Underlying it all is that I believe creativity is a great thing! It is a gift- that maybe we’ve wrapped up too well and pushed to the back of the cupboard. Being creative means that you have to be positive and open to possibility also essential traits in this climate. Creativity is empowering because it says you have a choice- you can create- you can contribute. 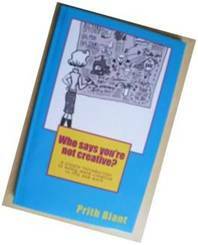 The book is about reconnecting to our inner creativity and using it in which ever way works best for you. This might be in work- with some fo the creative problem solving techniques. Or you may just want to ‘get out of your box’ more generally. I hope to take this work forward and continue my creative explorations- particularly in using creative mediums within the workplace. I am convinced, although I have no scientific proof yet, that thinking through different mediums can help you come up with more innovative solutions. I will be inviting people at my launch to come and explore with me at a pilot workshop in August. I look forward to your thoughts and pictures!